7 of the craziest TVs from CES 2015 | What Hi-Fi? The sublime and the ridiculous of the consumer technology world are both equally at home at CES, and the 2015 edition of the world's biggest trade show was no different. Televisions tend to make the headlines, with the biggest manufacturers vying for attention with ever-bigger, ever more ridiculous TV screens. From the size of the set to the technology on the inside, there are plenty of ways to ensure a second glance on the crowded showfloor - not least by making it a "world first" for something or other, as is the case with many of the TVs in this list. Confused by all the new technology? Read our guide to the TV tech on the market in 2015, from Dolby Vision to Quantum Dot. The Chinese brands had almost as big a presence as the Korean and Japanese brands this year, including Changhong, China's second-biggest TV manufacturer. The company had plenty of 4K screens and curved TVs, too, but this 105in CHIQ laser projection monster stood out for us. The LG Hecto screens have been around for a couple of years but this was the only sign of the technology at CES 2015 and showed, along with the other TVs on the stand, that the Chinese TV manufacturers can turn out pretty much any technology around. One way to stand out from the crowd and have a (kinda) world first, is to of course make-up your own marketing term. As Hisense has really done with ULED, which sounds cheekily close to OLED but is in fact an LED set with local dimming and Quantum Dot technology, similar to new QD sets from LG and Samsung (who call it SUHD). That said, comparisons between the ULED and OLED TVs on Hisense's CES stand were impressive - but not knowing how the TVs are set-up they are also, like most trade show demos of TVs, far from conclusive. "Optimized color, maximized viewing experience and an immersive screen size", says the information attached to this crazy TV. What's this? An OLED TV from Panasonic? 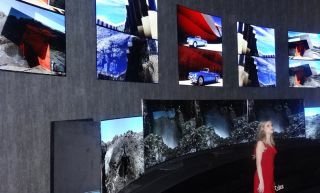 Yes, it wasn't just LG who had OLED TVs at CES - though LG was the only company with a full range ready to go. It may not be quite as crazy, nor a world first, but it was kept a touch under the radar by Panasonic so we think it worth highlighting. Not least as it seems Panasonic's OLED prototype might finally get an official release in 2015, according to various whispers. It was certainly one of the TV's that had us mesmerised the longest, despite the so-so stock video footage. Life after plasma for Panasonic TV? Fingers crossed. If the name of this TV didn't have your brain confused then looking at it probably would have done the job. Glassless 3D TVs have been around for a good few years - we even reviewed one from Toshiba - but they've never had quite this many pixels or indeed using Samsung's SUHD technology. Sharp decided to go 'Beyond 4K Ultra HD'... but not too far, with these TVs, finding a middle ground between 4K and 8K, should you for some reason want to buck the TV trend. Another world's first TV, this time from TCL. Who are they? Only the third largest TV manufacturer in the world, the Chinese group has been churning out panels for some time but is now pushing its own brand TVs, including in the US. As is often the case, working out exactly which element of the protracted model name is the "world's first" bit isn't always easy but we're fairly sure it's the size+curved+4K.